One of the items that gets the most use in our bathroom is our step stool. The kids use it to wash their hands and they like to store little items in the step storage area. My husband and I use it to reach the top shelves of our storage cabinets. Sometimes I even pull it out of the bathroom and use it to reach the top shelves of my bookcases! Thanks to CSN Stores, I have the opportunity to offer a giveaway not one but TWO KidKraft Step N' Store Stools. If you read yesterday's bathroom post, I'm sure you expected some sort of bathroom book holder giveaway from CSN. Now I'll be perfectly honest with you. I did an online search for a shelf or rack that would work for books in the bathroom. After all, CSN Stores is a huge group of over 200 online stores so I thought something interesting might pop up in my search. CSN does has a ton of bookcases and other storage products, and there were plenty of interesting options that I found. The Lexington Studios Bathroom Reading Book Organizer is one option. The Little Colorado Potty Chair with Accessories comes with a built in book rack, but it is meant for toddlers. Good options but I thought not everyone would find them useful. Everyone can use a good step stool though, right? CSN Stores has kindly offered to giveaway a KidKraft Step N' Store Stool to two (2) Brimful Curiosities readers. I don't personally own this step stool, so I can't offer a review, but it has received several favorable comments on both CSN and Amazon. Each winner will be able to choose a KidKraft Step N' Store Stool of their choice valued at $24.95 or less. There are several varieties and colors available in this style, including a pretty cool John Deere tractor design. • Contest ends on Monday, June 14th, 2010 at 11:59 PM CST. I love the ice blue! If I won, I'd pick KidKraft Step 'N Store Stool in Espresso - 15653. I'd like the step 'n store in natural. Aha! I knew it would be a step stool. :) I would love one of these! I would choose the two-step stool in white and decoupage it. :) Thanks for the great giveaway! I'd pick KidKraft Step 'N Store Stool in Cranberry! Nice color. I would choose the white one since it would go with everything. The white flip stool is neat. can be a bench or a step stool. I'd pick the Kid Craft 2 step in black. i love the two step stool in natural! and follow on twitter and will tweet this later! i would get the petal pink! We would love the cranberry color! The firetruck stool would be a winner with the young kids in my family. I think the KidKraft Two Step Stool in Natural - 15511 would be perfect. I love the KidCraft Step N Store Stool in cranberry - love it! I like the KidKraft Step 'N Store Stool in Blueberry - 15654! I would choose the KidKraft John Deere Step N' Store for my grandson. I like the fire truck! I am following your blog on google friend connect! I would like the two step stool in natural. I love the step n' store stool in petal pink. I'd want the two step stool in white. I would pick the step and store in vanilla. I would love to win the Blue - 15603. I would choose the KidKraft Step N' Store Stool in Natural. This would be perfect next to my sons' bookshelf so they can easily reach all of their books! I'd choose the KidKraft John Deere Step 'n Store in Pink. Thanks. The The KidKraft Two Step Stool in Natural would be our choice. Our little guy needs the extra height. Thanks for the giveaway. The KidKraft Two Step Stool in Natural would be great for our family. It looks like it would be good for my kids to help at the kitchen counter as well as at the bathroom sink! I would choose the KidKraft Step N' Store Stool in Ice Blue for my bathroom sink. I'd choose the John Deere design. Thanks for the giveaway! I love the natural look of wood so Step in Store in it's natural color is wonderful! I also subscribe via RSS (still would prefer the red stepstools). I really like the KidKraft Step n' Store Stool in Vanilla. I really like the natural! I like the KidKraft Two Step Stool in Natural. I like the Kidkraft John Deer Step n Store in pink! This would be a wonderful birthday present for me to win a KidKraft John Deere Step N' Store for my grandson who really loves tractors. My birthday is June 16. I'd choose either the fire truck or the john deere. too cute! I'd pick the vanilla color! Two Step Stool in Natural. If I win, I would probably choose the Fire Truck Step Stool - 76023. I like the Step 'N Store Stool in Espresso. I would love to have the Kidkraft Step and Store in Petal Pink. I would like the step n store in pink. I like the espresso one. I really like the espresso stool! 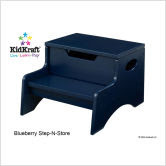 I love the KidKraft Step N' Store Stool in Blue. I would choose the Step N Store in chocolate brown. I'd pick the john deere step and store! KidKraft Step 'N Store Stool in Espresso - 15653. I would choose the two step stool in natural. I would choose the step n' store in white! I'd love it in blueberry! I love the espresso one!! Lots of great options though! I would like the KidKraft Step N Store in Espresso. Thanks! I'd choose the KidKraft Two Step Stool in Natural. I really like the Two Step Stool in Natural best. Very handy little piece of furniture! I love the stool in Espresso!